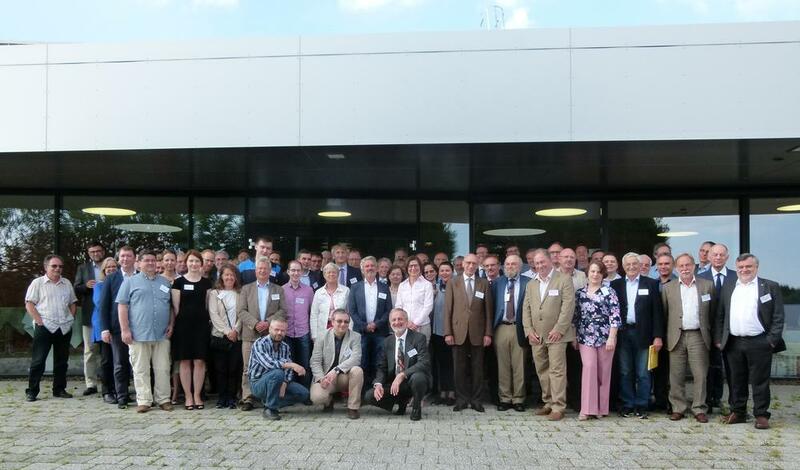 More than 70 participants attended the CREMLIN closing conference at DESY (photo: DESY/M. Kreuzeder). CREMLIN, which stands for “Connecting Russian and European Measures for Large-scale Research Infrastructures”, is drawing to an end after three years, having been sponsored with a 1.7 million euro grant from the EU Research and Innovation programme Horizon 2020. DESY is the coordinator of the consortium, which comprises a total of 19 European and Russian laboratories. The five Russian projects are the heavy ion collider NICA at the Joint Institute of Nuclear Research in Dubna, the research reactor PIK at the Petersburg Nuclear Physics Institute PNPI NRC KI in Gatchina, the high-energy laser facility XCELS at the Institute of Applied Physics in Nizhniy Novgorod, the lepton collider Super Charm-tau Factory at the Budker Institute in Novosibirsk, and a new, fourth-generation synchrotron radiation source, SSRS-4, at the Kurchatov Institute in Moscow. In the course of the project, the European and Russian partner laboratories not only analysed and demonstrated the potential for collaboration with these five large new Russian research facilities, but also worked out detailed proposals as to what schedules for collaboration they intend to pursue over the next ten or so years. “Since the very first day of the joint European-Russian initiative CREMLIN, all participants have shown their strong commitment to establish a close cooperation within the Russian Megascience projects. For me and my colleagues at the NRC Kurchatov Institute it was a nice experience to collaborate so closely with DESY and the European partners,” said Vladimir Kravchuk from the Kurchatov team, who supported the coordination of the project from the Russian end. 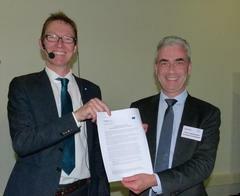 Pierre Quertenmont from the European Commission (right) receives the recommendation document from CREMLIN project manager Martin Sandhop (photo: DESY/M. Kreuzeder). More than 70 European and Russian scientists, managers and stakeholders in the consortium took part in the CREMLIN Closing Conference, along with guests involved in research, politics and innovation. The project manager Martin Sandhop (DESY) presented the “First CREMLIN Recommendations for the European-Russian Megascience Collaboration” to Pierre Quertenmont, the representative of the European Commission. Quertenmont expressed huge satisfaction with the way the project had been carried out and with the quality and practicability of the recommendations presented. In particular, the recommendations point beyond the existing horizons of the collaboration defined in the context of CREMLIN. The European Commission has announced a call for project proposals in the context of Horizon 2020, which will also include a flagship initiative with Russia in the field of “Policy and international cooperation measures for research infrastructures”. This future project is to be guided by the recommendations made by CREMLIN and will be equipped with a considerably larger budget than the existing CREMLIN project. The aim of this future project will be to set up design studies and make contributions to the instrumentation and technological developments surrounding the five megascience projects in a Russian-European collaboration, as well as developing a model for transnational access to a distinctly broader range of Russian research facilities. The long-term goal will be to ensure that European and Russian facilities are used equally by European and Russian scientists in a more closely aligned, broader and joint European-Russian research area.